Thank you for choosing Pam Bell Events. Hospitality and making people feel welcome is my specialty. I grew up in the South where hospitality is an art form and true to my heritage, this sense of caring for others is woven into everything I do. I’ve been planning events for at least 30 years. I’m happy to bring my expertise to your special occasion. Since Colonial days, up and down the eastern seaboard, the pineapple has represented gracious hospitality. It is for this reason I have chosen it as the symbol for my business. 20+ years as Event Florists and Wedding Designer. San Francisco Bay Area and Sonoma County. Four Years operating Dragonfly Floral School. Teaching floral enthusiasts of all levels the art of beautiful design and how to discover ones passion in nature. Project Coordinator for Dragonfly Floral, a 6 acre organic flower farm. Developing educational events including: Corporate Team Building, Farm Tours, Floral Design Immersion Programs & International Tours focused on current trends in the floral and garden industry. 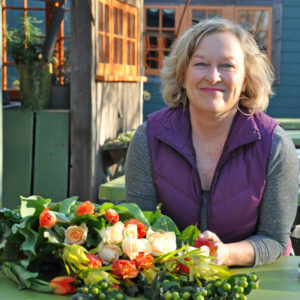 Seven years as Owner/Operator: Bell & Trunk Flowers – a SF based Floral Studio. Catering Director for Bay Area Hotel Chain: Coordinating and executing Weddings, Corporate Events, Life Celebrations. Sometimes playing host to 4 weddings in the same day. Regional Manager for Virginia based Event Company – providing Decor, sound, stage, lighting & tenting to Inaugural Balls, Society Events, National Sporting Events. Director of Food & Beverage for PGA Tour – organizing and executing the hospitality branches for National Golf Tournaments. As a travel professional working worldwide in the Luxury Travel segment for over 40 years, I recognize colleagues who are the best at handling high profile clients. Pam Bell is one of those rare greats and is able to coordinate and execute whatever she is presenting with grace and great style. Clients are gently directed, don’t ever feel excluded or pressured, and always have a grand time and learn new things. Bravo! Susie Maurer – President Landmark Travel Ltd.
Pam is simply the best event organizer I know. Creative vision, attention to detail, and meticulous follow-through, all combined with a strong sense of fun – there’s no-one I’d rather trust my event to. I have worked with Pam on several occasions and can’t say enough about her. If you need a sensitive, yet uplifting person on your side – she is the one. Two particular occasions when we worked together: During one of my art shows Pam provided a large floral arrangement that set the tone for the entire event. It brought me to tears, it was so beautiful. Little orchid blossom tied to large branches. It was unforgettable. Another event was a video shoot which she organized. It has gotten over 300,000 hits on youtube. Pam magically brings out the heart and soul of each particular event. She makes all the difference, and seemingly effortless. Pam has the ability to clearly communicate with clients, staff and students. Her creative, inspired work is of the highest quality. In April of 2017, we held our wedding in a private garden in Petaluma, CA. Pam was instrumental throughout the entire planning process an a indispensable player on the day of our big event. After Pam arrived, it seemed that things were set up and organized almost effortlessly. Food, drinks, cakes and the flowers! All for 120 guests. Because of Pam’s skills, experience and vivacious personality, our special day was beautiful. Simply put, Pam is the best! She is efficient, knowledgeable, and very creative. If you need a job done, go to Pam. Even here name has a nice “ring” to it…Pam Bell. Pam has a wonderfully warm personality and her professionalism, thoroughness and attention to detail make her an excellent day of coordinator/event planner. She is full of good ideas and creative solutions. And has the ability to see the big picture, which will allow your event to flow smoothly so you and your guests can fully experience and enjoy your entire day. Having worked with Pam on countless events from start to finish over the years, I have witnessed her skills in action and would highly recommend her for the job. I have known Pam for many years, always watching with admiration and appreciation for all that she brings to an event or class she is organizing. I have enjoyed our work together and relish the creativity and articulate focus she offers to the process. I cannot think of a better person to share your wedding day or the planning of a personal event with than the joyfully energetic Pam Bell! Pam is truly amazing in so many ways. She is an honest, good humored, artistic, friendly leader who educates and inspires those she comes in contact with. I’ve taken many of her floral design classes and several of her tours. She is a conscientious leader who takes each of her clients needs to heart. This is all done with compassionate focus, encouragement and great personal integrity. I’d follow her anywhere! Pam is everything you want in a planner. She made sure our party was beautiful and well-organized. We felt free to enjoy the party rather than worry about things happening! Pam Bell and I have worked together for 8 years in the floral business. Her design skills are masterful and, in addition to creating gorgeous voluptuous ceremony arrangements, she has what I consider to be the finest sense of detail when creating bridal bouquets, head wreaths for flower girls, and boutonnieres for groomsmen. We have spent many days together setting up events. Her easy, calming way along with her attention to detail put brides at ease . Her ability to foresee the next step involved in pulling off a large event, her positive and calm way of relating to fellow vendors, are invaluable. Always cheerful and sensitive to everyone’s needs and emotions, Pam is a real professional. Above all she is fun to work with! Her positive energy and great sense of humor add a wonderful element to the event. I recommend Pam to coordinate any event large or small. Thank you for contacting Pam Bell Events. Or, you could do something revolutionary and call me.